The Manual Periscope Feed Head™ is a feed broadcast hose outlet attachment designed to maximise feed blower energy for best possible feed pellet broadcast distance and coverage. Often there is a tendency to simply force the handheld feed broadcast hose into a tight bend to clear site obstructions or redirect feed pellet drop to new locations within the pen, pond or raceway without repositioning the feed broadcaster. Tight hose bends cause feed abrasion resulting in rapid hose wear, hose breakage, and most importantly a decrease in feed broadcast distance and effective coverage. 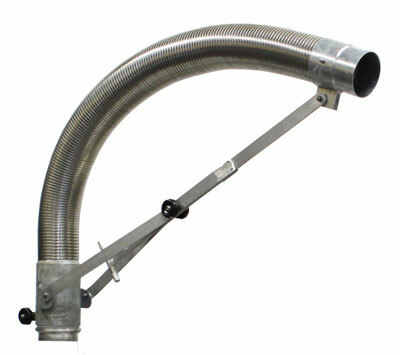 The Manual Periscope Feed Head™ is designed to insure best feed hose shape and positioning, and to address the tiring process of hand holding and moving an awkward feed broadcast hose, especially when additional attachments such as the Feed Extension Tube or Gull Wing Deflectors are in use. Offered in 4-inch (102mm) and 5-inch (127 mm) hose diameters, the Manual Periscope Feed Head™ mounts to the front face of any model S125 or larger AeroSpreader™ Dry Pellet Feed Broadcaster. 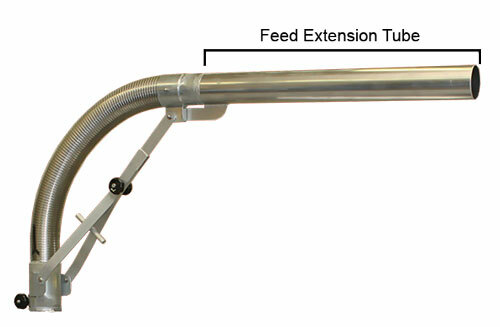 This feed broadcast option utilizes the feed broadcaster’s existing handheld lined stainless steel flex hose assembly. The feed head can rotate a full 360-degrees and the operator can adjust the top hose bend radius to set feed pellet trajectory. The Manual Periscope Feed Head™ is our most versatile feed broadcaster option. It is ideally suited for vessel applications where the feed broadcast hose needs to clear a gunnel or handrail. Similarly, this broadcast hose option is also ideally suited for an ATV or pick-up truck positioned AeroSpreader™ where operators require a support assembly to either eliminate the need for a second operator to operate the feed broadcaster, or to address how best to support the feed broadcast hose assembly while in motion. When a Manual Periscope Feed Head™ is matched to an AeroSpreader™ feed broadcaster positioned at the junction of 4 pens, cages, or tanks, a single AeroSpreader™ Dry Pellet Feed Broadcaster will do the work of 4 air blower feeders. All aluminum and stainless steel construction and attention to detail means the lined stainless steel flex hose will last years. Eliminates ability for operators to kink or create tight radius bends that cause pellet abrasion, premature hose wear, and hose failure. Self-supporting platform eliminates the problem of site setup of handheld feed broadcast hoses. An ideal operating platform from which to add Feed Extension Tube and Gull Wing Deflector options. Eliminates the need for a second operator and allows single operator to set up and monitor while addressing other site farm husbandry tasks. Design insures gentle feed broadcast hose radius/sweep bends needed to maximize air/feed broadcast velocities and maximize feed broadcast distances. The Periscope Feed Head™ option can be ordered at time of feeder purchase or ordered separately for easy on site installation. The rotating head assembly offers the ability to aim feed pellet broadcast drop anywhere over a 360-degree circle. Adjustable slide strut sets feed drop distance from blower.